General Description: The Maples is a very large, broad, thick, short stemmed knife blade with shoulders that are tapered and a stem that is contracting to rounded with a concave to straight base. The basal edge is excurvate or straight, usually thinned and may be ground. The Maples is usually very thick and crudely made however examples showing high quality knapping have been found. The cross-section ranges from flat to twisted to biconvex. The blade edges of the Maples are excurvate but can be straight. The distal end is usually acute. The Maples almost always has random knapping scars and thus this type should not be confused with the Morrow Mountain type which is similar in outline but has Archaic parallel flaking scars. Broad, shallow to deep flaking was used to shape the blade and stem. A minimum of secondary flaking was used and on some examples, only one edge of a blade face was secondarily flaked. 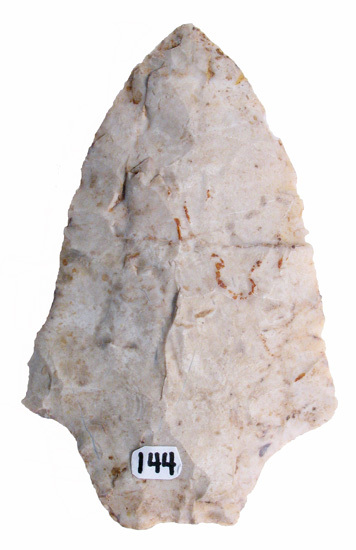 Local materials were used, especially Ft. Payne chert. Perino hypothesizes that the Maples could be a preform for the either the Abbey point or an otherwise unnamed point type. The point is often found in shell mounds along the Tennessee River in Alabama, Tennessee and also in northern Mississippi. The size of the Maples ranges from 61 mm to 120 mm in length, shoulder width ranges from 37 mm to 72 mm, stem width ranges from 24 mm to 50 mm, stem length ranges from 8 mm to 16 mm, thickness ranges from 10 mm to 18 mm. The Maples was named by James W. Cambron in 1962 for examples which he found in sites along the Elk River near Maples Bridge, Limestone County, Alabama.